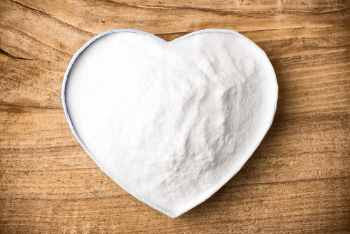 Baking Soda or baking soda is widely used in the kitchen. It has many uses in many useful ways besides entering it in the preparation of some foods and sweets, and it is widely available material, in addition to its cheap price and free from damage, which we can use in many purposes. you just Mix 2 tsp of baking soda in a cup of water. Swish, spit and rinse. Easy mouth wash that can neutralize odors. Use Baking Soda to stimulate the mouth. Place a teaspoon of Baking Soda on half a glass of water and stir with your mouth and notice how refreshing it is. Polish your teeth a lot of people will use baking soda as a natural toothpaste. because exist some concern, however, that the baking soda can be too abrasive for everyday use (although there are plenty of people who swear by it), but even you using it from time to time to help polish and whiten teeth is easy and effective. I’ll add a little baking soda to my normal homemade toothpaste every few days when I want a little boost. To get quick bleaching of teeth, put a little baking soda on your toothbrush and brush your teeth well, then wash them with paste. WARNING: Use soda frequently on teeth so as not to cause tooth enamel erosion. To sterilize the mouth and teeth, put a teaspoon of baking soda in a quarter cup of water and use it for a daily rinse. Mix a little baking soda with water to get a thick paste. Place this paste on the affected areas for 15 minutes and then rinse with cold water. This is great for tile floors: Use 1/2 cup baking soda in a bucket of warm water to help mop and clean the floors. Oral appliances like mouthpieces, braces, retainers, and dentures need to be cleaned in order to remove odor and food particles that get trapped. The last thing you want is spraying these things with chemical cleaners. Carpet stains are an accident waiting to happen so it’ll be wise to be prepared. Fortunately, there are two products that are cheap, readily available and non-toxic – vinegar and baking soda. To spot clean the carpet stains pour vinegar on the affected area then sprinkle baking soda over it. The use of Baking Soda does not end in house cleaning. Spray Baking Soda on any surface you wish to clean, be it tubs, dishes, or floors and you will notice their luster, and it will extract you from excess grease. The uses of Baking Soda do not end at that limit but extend to carpet cleaning. Sprinkle a heavy amount of Baking Soda on the dirty carpet and leave it overnight, and in the morning remove it with a vacuum cleaner and you will see how the carpet has become clean. Baking Soda is used to remove ants by spraying salt with Baking Soda in places where the ants are present, and this helps to expel it. Keep Flowers Fresher Longer and Maintains and prolongs the flower life, if added to the vase water. just rub your hands with baking soda and water to get rid of strong odors like the garlic or the onion. Of Baking Soda uses also prevent bad sweat odor, just massage the bottom of the armpits with Baking Soda in the morning. Cleansing the skin from accumulated dead oils and cells is essential to brighten the skin and its health. Try this recipe, which ensures that you peel and clean your skin away from harsh industrial peels on the skin. Mix a tablespoon of natural white honey with a teaspoon of baking soda and massage your face in a nice circular motion. Leave it on your face for a minute and then rinse with warm water. Mix 4 tbsp with 10 drops of your favorite aromatic oil and rub your forearms with an old toothbrush. Keep the mixture in a tightly sealed container and use it when needed. put an open box in the back of your refrigerator to help neutralize odors. Just you must be sure to change box every couple of months. Especially sportswear, and remove the dirt easily by adding the amount of half a cup of bicarbonate to the wash water. For heavy-duty washing: soak the clothes in water, dissolved in soda bicarbonate To stain oil and grease in clothing: add soda bicarbonate to the wash water. Vaginal infections are common in many women as a result of fungal infections and to eliminate vaginal infections and associated itching. Add a tablespoon of Baking Soda to a liter of warm water and use the mixture as a vaginal wash twice a day. Add a bit of Baking Soda to your shampoo when you wash your hair. It helps you get rid of the effects of cosmetics used for hair styling. These are some of the uses of Baking Soda in the field of hair care. 10 - Wash your hairbrush and comb by infusing it with bicarbonate water Sodium to remove the accumulated oil and dust. - One of the uses of Baking Soda is that it works as a cleanser for the face, just put a few of them into honey and massage your skin and leave it for 15 minutes and then wash it with water. - Use Baking Soda as an effective alternative to dry shampoo, to refresh your hair at times when you rush out. - You can use Baking Soda as an effective way to clean artificial dentures in the case of the entry of flash disks. - Do you know that you can dispense with soap and water to wash your hands and replace them with a mixture of Baking Soda, honey, and a little cornmeal? - Baking Soda is used to extinguish the limited fire caused by electricity, gas or the kitchen by extinguishing the source of the fire first, and then spraying a quantity of Baking Soda on it when heated produces carbon dioxide capable of extinguishing the fire. - To clean the dishwasher to be placed instead of soap in its normal will help to clean it. - To clean pots of burnt foods: Fill the pots with water dissolved in soda bicarbonate for 10 minutes before washing ... If the food is attached and a thick layer put a large amount of soda and less water. - baking Soda Use in shower Add half a cup of baking soda in shower water and relax in the bathtub for half an hour. Baking soda dissolves in water and is a cleanser and tonic for the body as it works to remove the oils and sweat accumulated on your skin. - To clean the toothbrush: Wet the brush with water and then put the soda and wash the teeth. - For the chicken ... When removing the feathers, add a teaspoon of soda to the boiled water not only help to remove feathers easily but also to clean the skin and its gloss. - For dry beans .. soak them to make them easier to digest. To clean windows and cars, especially rain effects wipe it with a cloth dampened with a solution of soda bicarbonate.